Day 2 #zerotohero About – What’s your name? 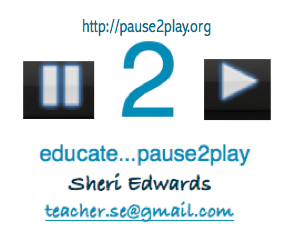 Today’s challenge is to choose a title [ Pause 2 Play ] and add a tagline [ Pause and reflect to play and learn… ] that will reflect our blog’s purpose. In addition, an “About” page or widget helps readers know what your blog is about, which helps drive readers to stick around. This blog began in 2010 with Posterous, which became extinct, so WordPress became the new home in 2013. And it was time for a change. Today I shortened and clarified my About this blog and revised the history page to include the new focus. I made sure the main ideas were at the top and colored for quick review. I found some extinct links and made corrections; I added new pictures; I revised how readers navigated to these pages. I had already chosen a cleaner design that works as well on mobile devices as it does online, for my purpose at least. Whenever I visit a blog, I like to know who the person is [ About Me ] behind the words, to know their perspective and focus. I think it’s important to know the name and how to contact them. I realized I needed a quick and short page for what the blog is about, although you can usually tell by the first few posts and by the categories. A tag cloud also helps. I really would like to be better at deciding categories. I’m sure we’ll get into that in this challenge. So, in the image below, you will se the title of the blog, two pages showing [ Home and About ]. At right at the top is the tagline and below that is the link to the About Pause 2 Play, which briefly explains the blog’s purpose. What do you think of the changes? What about your blog? Will your readers know who you are and what your focus is? This entry was posted in About Blogging, Challenges, Personal and tagged blogging, challenge, zerotohero. Bookmark the permalink.